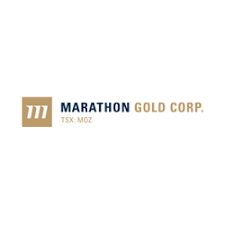 Marathon Gold Corporation (TSX: MOZ) is pleased to announce excellent results from the first drill holes of the 2019 exploration drilling campaign at the Valentine Lake Gold Camp. The drill holes MA-19-348 and MA-19-349 were strategically located between existing, strongly mineralized drill holes in the open pit portion of the Marathon Deposit (Figure 1). These drill holes succeeded in intersected strongly mineralized, en-echelon stacked QTP-Au veining with wide intervals of higher-grade gold intercepts. This provides additional support of our geological model, demonstrating the extensive lateral continuity of the QTP-Au veining into adjacent drill holes both along and across strike. It is also significant to note that there is significant low- grade mineralization between the higher-grade intervals in drill holes MA-19-348 and MA-19-349. “The success of new infill drill holes into the Marathon Deposit open-pit cannot be overstated”, said Phillip Walford, President and CEO of Marathon Gold. “Our geological model is sound and additional 2019 infill drill holes, for which assays are still pending, have likewise intersected wide intervals of QTP veining with abundant visible gold. The assays released today are fire assays and all assays above 0.1 g/t are further assayed using the metallic screen method to better estimate the gold content when free gold is present. At the Marathon Deposit, fire assay analysis greater than 1.5 g/t Au typically show a significant increase in grade, sometimes more than 100%, with metallic screening, while analysis below 1.5 g/t Au may show a slight decrease in gold grade”. TABLE 1: Significant assay intervals, Marathon Deposit, Valentine Lake Gold Camp. Marathon acknowledges the financial support of the Junior Exploration Assistance Program, Department of Natural Resources, Government of Newfoundland and Labrador. Sherry Dunsworth, M.Sc., P. Geo., Senior VP of Exploration, Marathon’s Qualified Person, has reviewed the contents for accuracy and has approved this press release on behalf of Marathon. Thorough QA/QC protocols are followed including the insertion of blanks and standards at regular intervals in each sample batch. Drill core is cut in half with one half retained at site, the other half tagged and sent to Eastern Analytical Limited in Springdale, Newfoundland. All reported core samples are analyzed for Au by fire assay (30g) with AA finish. All samples above 0.10 g/t Au in economically interesting intervals are further assayed using metallic screen to mitigate the presence of coarse gold. Significant mineralized intervals are reported in Table 1 as core lengths and estimated true thickness (95% of core length).